Consumer-like experience. We don’t believe enterprise software needs to be clunky and complex. Turvo’s intuitive, beautiful interface means more productivity, fewer errors, and less training. A picture is worth a thousand words. From dashboards to charts to logos, we designed Turvo to be highly visual so, at a glance, you can easily make sense of all the information you need. Run your business from your phone. Turvo’s powerful iOS and Android apps give you 24/7 access to all your shipments wherever you are. Responsive to any screen size. Whether you are working at a dual-monitor workstation or lounging on the couch with your tablet, Turvo is crafted to work the way you work. Notifications when and where you want them. Text message, email, or app notification? 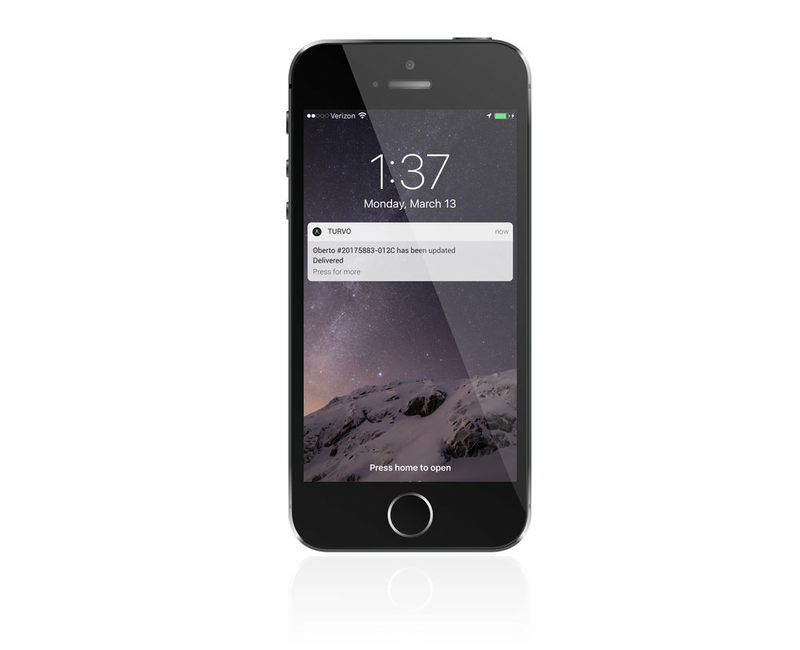 You choose what notifications you want and where you want them delivered. Track and trace in real time. 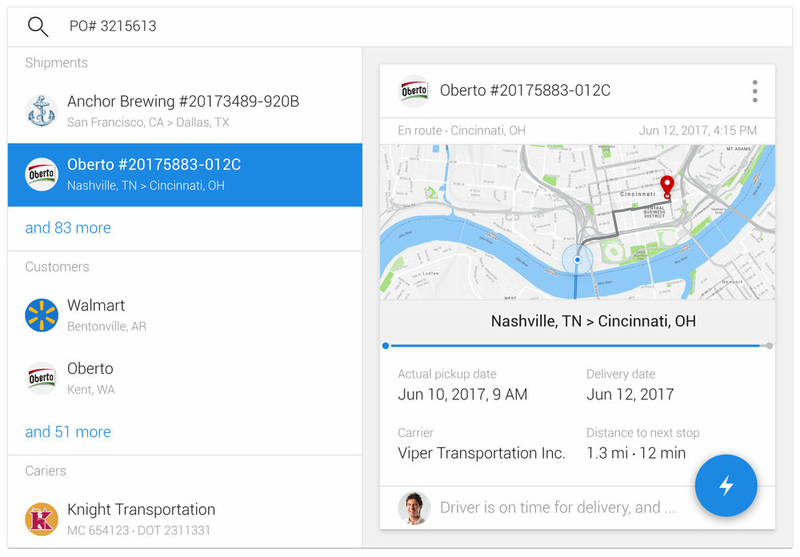 Track shipments in real-time from dispatch to delivery using the Turvo mobile app. No more guesswork. Know when the driver arrives and leaves, get real-time updates, and receive documents as soon as they’re e-signed. See everything in a timeline. Turvo captures every event, so you can easily go back and answer who, what, and when questions. Your information cockpit. 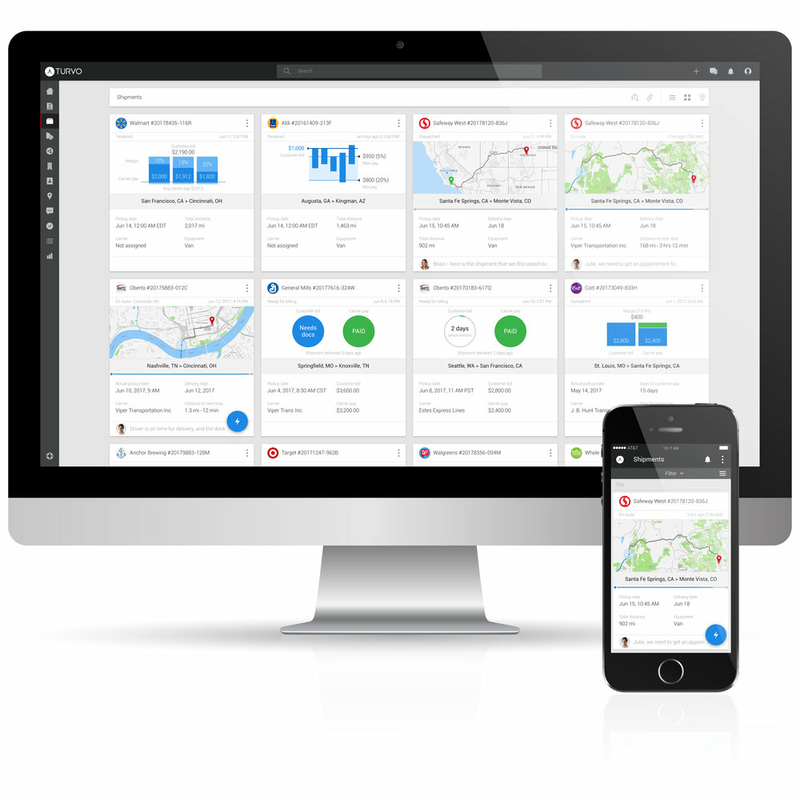 The Turvo dashboard puts all your key business metrics and information at your fingertips to help you make faster decisions. No more app switching. Orders, shipments, documents, tasks, messenger, and more, all deeply integrated into the platform. Everything is connected and seamlessly works together. Everyone on the same page. Securely share shipments in Turvo so everyone has instant access to the right information. No more email back and forth. Privacy by design. With granular privacy controls you decide who gets to see what, when you share. Integrate with EDI and ERP. Turvo is designed to work with the most popular ERP systems and is compatible with the X12 EDI transaction set. Communicate with context. With Turvo Messenger, link the relevant order, shipment, or account to your message so everyone instantly has the business context to quickly take action. Message inside and outside your organization. Whether you're sending a private message or updating a customer about a delay, Turvo Messenger handles it all securely. Contact management. Easily manage and organize contacts and accounts so everyone on the team has access to the right information all in one place. Tasks with context. Task management is built into Turvo so you can easily link the relevant order, shipment or account to a task and everything you need to accomplish the task is right there. Delegate with a click. Easily assign tasks to your team or even people outside your organization so everyone knows who’s doing what. Notifications keep you in the loop. With configurable notifications, you’ll know the instant a task is due, assigned to you, or changed. Real-time presence. Know right away when someone else is viewing the shipment you’re in and, at a glance, see the history of who last edited it. Multiple editors are no problem. See what section someone is editing and, with one click, message them so you don’t step on each other’s toes. Digital documents with versioning. Manage all your documents in one place, and easily go back to another version if anyone makes the wrong update. Digital invoicing. Easily create and track digital invoices in Turvo so you can get paid faster. Painless payments. Making a payment is simple and fast with automated rules for fees and more. Works with major accounting systems. Sync invoices and payments to your accounting system in real-time. Universal search. 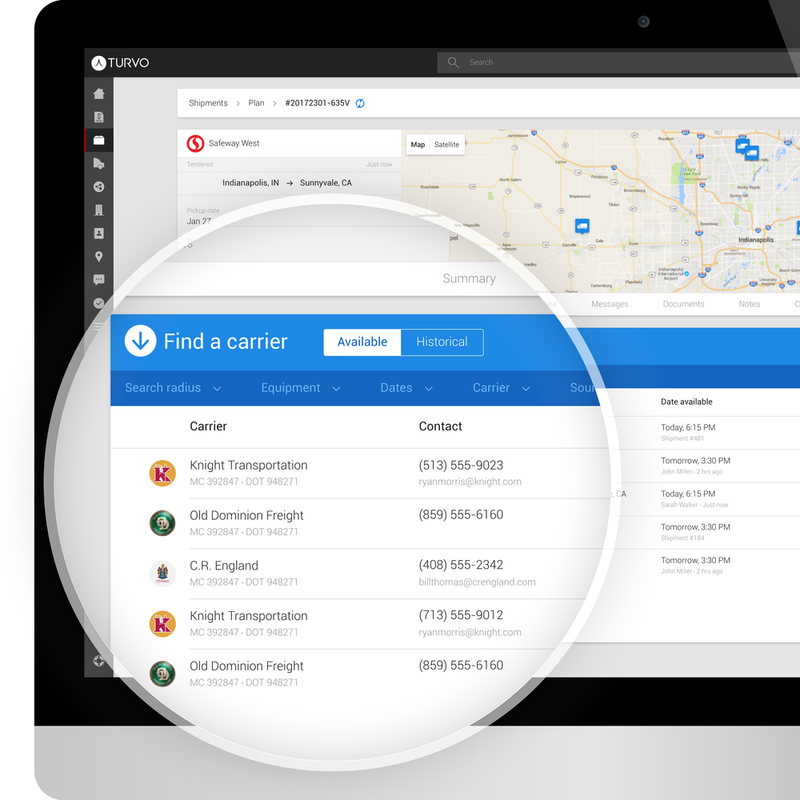 From one search box, find a shipment, order, or invoice instantly. No more hide and seek! Search previews. From the search results, see a preview of what you’re looking for and take action right from that preview. Tag anything. Create your own tags and apply them to shipments, contacts, accounts, and more so you can easily find them later. Quick actions. The quick action button puts the most relevant actions at your fingertips to help you get things done faster. Actions in reports: We don’t believe reports should only be informative. With Turvo, take actions right in the report, whether making payments or reconciling transactions. Stay in the know. Smart notifications keep you updated whether a shipment is running late, a task is due, or you missed an important message. You decide what's important. You choose which events are critical and which ones can wait, so you can stay up-to-date without being overwhelmed. Don't miss out, even on the go. You pick how to be notified. Be as connected as you want to be via email, text, web, or in app notifications on your phone. Carrier matching. Using AI-powered algorithms, Turvo matches your shipment with recommended carriers based on availability, cost, and performance. Price optimization. Better understand supply and demand in real-time with bid-ask information so you can make smarter, faster decisions. Orders in, shipments out. Powerful tools and intelligent automation make it easy to consolidate and split orders into shipments that optimize route, capacity and costs.